Agrippa I, also called Agrippa the Great (10 B.C.E. – 44 C.E. ), was the last king of the Jews. He was the grandson of Herod the Great and son of Aristobulus IV and Berenice. His original name was Marcus Julius Agrippa, and he is the king named "Herod" in the Acts of the Apostles in the New Testament, while his son Agrippa II is called "Agrippa." He should also not be confused with Marcus Vipsanius Agrippa (c. 63 B.C.E.–12 B.C.E. ), who was a well known Roman statesman and general. Sent by Herod the Great to be educated in Rome, the young Agrippa became a favorite in court circles, but suffered several dramatic changes of fortune until the ascension of his friend Caligula to the imperial throne. After Caligula's death, he helped Claudius to succeed him. Agrippa soon became a major client-king for Rome, ruling over a territory as great even as his grandfather. Unlike Herod the Great, however, Agrippa seems to have been highly popular among the Jews. Although extravagant in his youth, he was careful to observe Jewish customs as king, and was able to perform several services for which he is recognized by Jewish sources with gratitude. To the Christians, however, Agrippa became an enemy because of his repression of the new faith's leaders. Accounts of his death, at games held in Caesaria in 44 C.E., differ. Josephus and Acts agree that he died after being declared as speaking with the voice of a deity. However, Acts implies divine retribution, while Josephus sees the death as an act of fate. Other Jewish traditions hold the Romans responsible for his death, due to their jealousy of Agrippa's popularity and fear of a possible rebellion. His adolescent son Agrippa II did not succeed him as king of the Jews, as the area came under direct Roman rule through a procurator, as it had a generation earlier. Josephus informs us that, after the murder of his father, young Agrippa was sent by his grandfather, Herod the Great, to the imperial court in Rome. There, Emperor Tiberius developed a great affection for him, and placed him near his son Drusus, who also befriended him. On the death of Drusus, Agrippa was obliged to leave Rome because of his extravagant ways. 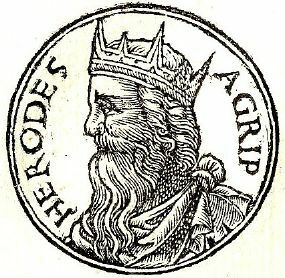 After a brief seclusion, Agrippa's fortunes improved due to the intervention of his uncle, Herod Antipas, who had been appointed tetrarch of Galilee Perea. Antipas had also married Agrippa's sister Herodias, an act for which he was famously denounced by John the Baptist, since Heriodias had previously been married to Antipas' brother. Herodias apparently influenced Antipas to name Agrippa as overseer of markets in the new capital city of Tiberias. Antipas also supported him with a large sum of money. However, when this support was discontinued, Agrippa was forced to leave Judea, going first to Antioch, and afterwards returning to Rome in the year 36. There he was again welcomed by Tiberius and became the constant companion of the future Emperor Caligula, then a popular favorite. However, when Agrippa was allegedly overheard to express a wish for the aged Tiberius' death and the advancement of Caligula, he was betrayed to the emperor and cast into prison. Agrippa suffered in prison for six months in constant terror of death, until Caligula indeed succeeded Tiberius and reportedly freed Agrippa with his own hands. Agrippa was soon made governor of the territories of Batanaea and Trachonitis that his cousin Herod Philip I had held. He was then appointed to the tetrarchy of Lysanias, with the title of "king." In 39 C.E., Agrippa returned to Rome and secured the banishment of his uncle Antipas, whose tetrarchy of Galilee and Perea he was then granted. His influence with Caligula put him in a position to help his people significantly and thereby win the praise of ancient Jewish historians. When Caligula ordered that his statues be set up in all temples and receive divine honors, the Jews alone dared to offer resistance to this decree. They induced the Syrian governor, Petronius, to postpone this desecration of the sanctuary for a long time. When he at last determined to inform the emperor that the execution of his order would be impossible without terrible massacres, Agrippa happened to be in Rome at that time. He was instrumental in convincing Caligula to repeal of his odious edict (Philo, "Legatio ad Cajum," §§ 30-43). On the assassination of Caligula in 41, Agrippa's advice helped to secure Claudius' accession as emperor. As a reward for his assistance, Claudius gave Agrippa the government of Judea, while the kingdom of Chalkis in Lebanon was given to his brother Herod III at Agrippa's request. Thus Agrippa became one of the greatest princes of the east, the territory he possessed equaling in extent that held by his grandfather Herod the Great. Agrippa returned to Judea, where his government eared the praise of the Jewish sources. His zeal, private and public, for Judaism is recorded by Josephus, Philo of Alexandria, and the ancient rabbis. 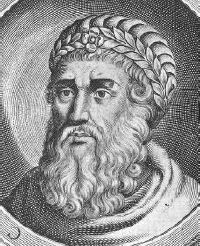 The Jewish Encylopedia relates that, in Rome: "The evil consequences of a ruler's unbridled passions and tyranny... had taught him moderation and strict self-control. His people regarded him with love and devotion, because he healed with a tender hand the deep wounds inflicted upon the national susceptibilities by brutal Roman governors. He ruled his subjects with compassion and friendliness." The sources indicate that Agrippa honored the Jewish Law. He personally carried his sacrificial basket of first-fruits to the Temple of Jerusalem and celebrated the Feast of Tabernacles with the common people. He devoted to the sanctuary a golden chain with which Caligula had honored him. On one occasion, while in the street, he met a bridal procession which drew up to let him pass, but he halted and bade it take precedence. He also sought to lighten taxation, and on the coins minted by him he carefully avoided placing any idolatrous symbols which could offend religious sentiment. After Passover in 44, Agrippa went to Caesarea, where he had games performed in honor of Claudius. In the midst of his elation, Josephus reports that Agrippa saw an owl perched over his head. During his imprisonment by Tiberius a similar omen had been interpreted as portending his speedy release, with the warning that should he behold the same sight again, he would die within five days. Josephus says that he was immediately smitten with violent pains and accepted his imminent death. He experienced heart pains and a pain in his abdomen, and died after five days. 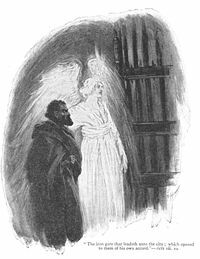 Saint Peter is freed by an angel after being imprisoned by Herod Agrippa. The New Testament (Acts 12) gives a slightly different account of these events, in which Agrippa's death appears to result from his his opposition to the Christian movement and his accepting god-like adulation from the populace. About the time of the Passover in 44, James, son of Zebedee, was seized at Agrippa's orders and put to death by beheading. Agrippa proceeded also to arrest Peter and imprison him. God, however, sent an angel, and the angel released Peter. After that Passover, Agrippa went to Caesarea, where the inhabitants of Tyre and Sidon waited on him to sue for peace. Agrippa, gorgeously arrayed, received them in the stadium and addressed them from a throne, while the audience cried out that his was "the voice of a god, not a man." (This part of the account is virtually identical to that of Josephus). But "the angel of the Lord smote him," and shortly afterwards he died, "eaten of worms," in 44 C.E. A third account omits all the miraculous elements in the story and says that Agrippa was assassinated by the Romans, who objected to his growing power. When he began to repair the fortifications of the capital, he was abruptly bidden to cease by the imperial authority. His attempts to fraternize with neighboring peoples—vassals of Rome—were construed as portending rebellion. This circumstantial evidence, according to this account, leads to the conclusion that "his sudden death at the games in Cæsarea, 44, must be considered as a stroke of Roman politics. His death, while in the full vigor of his years, was deeply lamented by his people, notwithstanding the fact that he had made many considerable concessions to heathen manners and customs." At the time of his death, Agrippa's only legitimate successor was his adolescent son of the same name. Therefore, the Roman Emperor Claudius decided to return Iudaea Province to the rule of Roman procurators, as had been the case during the time of Jesus' when Pontius Pilate governed the area. Agrippa I was the last king of the Jews, having been given the title by his Roman overlords. His reign was a popular and prosperous one, but ended with the Romans returning to a system of direct governance under a Roman procurator. Agrippa II would act in various capacities for the Romans, most famously when Paul of Tarsus appeared before him to plead his cause at Caesarea Maritima (Acts 26), in 59 C.E. Within a generation after Agrippa I's death, the Jews rebelled against the Romans, resulting in the tragic destruction of Jerusalem and its temple in 66 C.E. ↑ Agrippa I Jewish Encyclopedia. Retrieved May 6, 2008. This page was last modified on 9 February 2019, at 16:31.